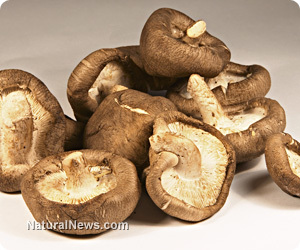 (NaturalNews) For centuries, shiitake mushrooms (Lentinula edodes) have been utilized as a medicine in their native East Asia. Traditional Chinese medicine, for instance, would commonly prescribe shiitake for people suffering from upper respiratory disease, poor blood circulation and fatigue. In Japan, shiitake were beloved for their anti-aging properties. And Europeans, who have rigorously studied shiitake under the microscope since they first arrived on the continent, appreciate their impressive cholesterol lowering and weight loss properties. However, an American study published in the Cancer Prevention Research journal has also found that a compound present in shiitake mushrooms can suppress the rate of cervical cancer growth, making them a viable alternative for aggressive and unnatural allopathic cancer treatments. The results showed that AHCC suppressed HPV in all three trials. In the first trial, the AHCC suppressed HPV expression during the first 24 hours, but the HPV came back with a vengeance during the next 24 hours. Fortunately, continuous in vitro exposure -- such as that experienced in the other two trials -- resulted in sustained HPV suppression. Specifically, sustained AHCC treatment resulted in an overall 15.9 percent decrease in HPV activity compared to the control groups. "[T]hese data suggest daily dosing of AHCC will eradicate HPV 16/18 infections and may have a role in the prevention of HPV-related cervical cancer," concluded Dr. Judith Smith, lead researcher and scientist at the University of Texas. "Furthermore, there is a potential for the addition of AHCC to primary treatment regimens for cervical cancer, which may potentially improve response rates and prevent recurrence."